Louis Ashbourne Serkis plays a spirited 12-year-old sucked into a fantastical quest in The Kid Who Would Be King. Eight years ago, the British comedian Joe Cornish wrote and directed Attack the Block, a sci-fi horror-comedy about a bunch of rowdy South London teenagers warding off aliens from outer space. It was funny, scary and also touchingly sincere in its belief that children are the future, that the fate of the world really does rest on our young people's shoulders. That conviction hasn't flagged a bit in Cornish's long-overdue follow-up, The Kid Who Would Be King, a delightful modern-day riff on the legend of King Arthur and his Knights of the Round Table. As you might guess from the title, this one is aimed at an even younger audience. Cornish was a co-writer on Steven Spielberg's animated caper The Adventures of Tintin, and although the new movie is in live-action, it has some of the same cheeky, family-friendly sensibility. It also has some of the irrepressible spirit of The Goonies, E.T. and other popular '80s adventure movies that bear the Spielberg name. But if The Kid Who Would Be King has an affectionately retro vibe, it's also very much in tune with its moment. Although the word "Brexit" is never spoken, it hardly needs to be, given the none-too-subtle references to a Britain that is fearful, divided and in need of a true leader. 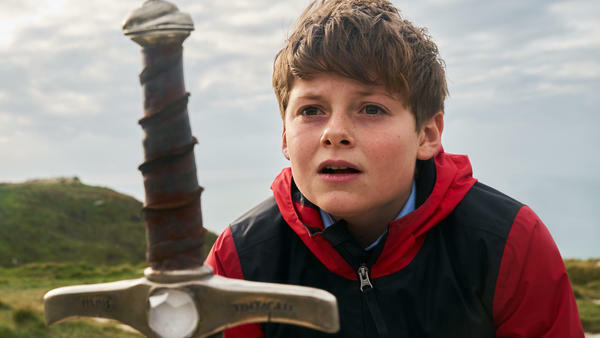 Enter Alex, a spirited 12-year-old played by Louis Ashbourne Serkis, who lives with his mother in London and has a deep love for Arthurian lore. Alex shows his own courage and purity of heart at school, bravely defending his best friend, Bedders, from two nasty bullies named Lance and Kaye. One night, while being chased by those bullies, Alex takes shelter at a construction site and stumbles on — what else? — a sword in a stone. He pulls the weapon loose, not yet realizing that he is holding the legendary Excalibur, and that the sword has come to him for a mighty purpose. Before long Alex is visited by the great wizard Merlin, who takes on many different forms: Sometimes he's played by Patrick Stewart in a Led Zeppelin T-shirt, and sometimes he transforms into a computer-generated owl. Most of the time, though, he is inhabited by the Gumby-limbed young actor Angus Imrie, who brings a witty sense of showmanship to the role. Among other tasks, Alex and Bedders are charged with slaying the evil enchantress Morgana, who, when she isn't assuming the form of a fire-breathing dragon, is played by Rebecca Ferguson of the Mission: Impossible movies. Morgana was vanquished centuries ago by her half-brother, King Arthur, and imprisoned deep within the bowels of the earth. Now she threatens to break free, return to England and rule over all humanity by claiming Excalibur for herself. In order to defeat Morgana, Alex and Bedders must join forces with their old tormentors, Lance and Kaye. In The Kid Who Would Be King, even the meanest bullies can tap into their inner kindness and decency. The story's big life lessons are like that — a little clunky and unapologetically on-the-nose, but also hard to argue with. And for all its intended uplift, the movie never feels medicinal. Cornish has a brisk, energetic way with action, and he keeps the quest flowing from one mini-adventure to the next, whether he's whisking his characters through a magic portal at Stonehenge, having them flee on horseback from Morgana's nasty minions or introducing them to the mythic Lady of the Lake, who gives the movie one of its best sight gags. Elsewhere, the script is peppered with tongue-in-cheek references to Harry Potter and Game of Thrones, and it's likely no accident that the actor who plays Alex is the son of Andy Serkis, who so brilliantly captured the soul of Gollum in The Lord of the Rings trilogy. It remains to be seen whether the young Serkis has his dad's chameleon like instincts. But for now, he makes a thoroughly engaging protagonist — sweet but uncloying, brave and true, a kid you would trust to lead his entire student body into battle, dressed in shiny discount armor from a medieval souvenir shop. It's an image as ridiculous and inspiring as the movie itself. This is FRESH AIR. "The Kid Who Would Be King" is a juvenile fantasy film rooted in the legend of King Arthur. It's set in contemporary Britain as a pre-teen boy and his friends fight to save the country from an ancient evil. The cast features Patrick Stewart and Rebecca Ferguson. The movie was written and directed by Joe Cornish, who made his feature debut with the 2011 action movie "Attack The Block." Film critic Justin Chang has this review of "The Kid Who Would Be King." JUSTIN CHANG, BYLINE: Eight years ago, the British comedian Joe Cornish wrote and directed "Attack The Block," a sci-fi horror comedy about a bunch of rowdy South London teenagers warding off aliens from outer space. It was funny, scary and also touchingly sincere in its belief that children are the future, that the fate of the world really does rest on our young people's shoulders. That conviction hasn't flagged a bit in Cornish's long-overdue follow-up, "The Kid Who Would Be King," a delightful modern-day riff on the legend of King Arthur and his Knights of the Round Table. As you might guess from the title, this one is aimed at an even younger audience. Cornish was a co-writer on Steven Spielberg's animated caper "The Adventures Of Tintin." And although the new movie is in live-action, it has some of the same cheeky, family-friendly sensibility. It also has some of the irrepressible spirit of "The Goonies," "E.T." and other popular '80s adventure movies that bear the Spielberg name. But if "The Kid Who Would Be King" has an affectionately retro vibe, it's also very much in tune with its moment. Although the word Brexit is never spoken, it hardly needs to be given the none-too-subtle references to a Britain that is fearful, divided and in need of a true leader. Enter Alex, a spirited 12-year-old played by Louis Ashbourne Serkis, who lives with his mother in London and has a deep love for Arthurian lore. Alex shows his own courage and purity of heart at school, bravely defending his best friend, Bedders, from two nasty bullies named Lance and Kaye. One night, while being chased by those bullies, Alex takes shelter at a construction site and stumbles on - what else? - a sword in a stone. He pulls the weapon loose, not yet realizing that he is holding the legendary Excalibur and that the sword has come to him for a mighty purpose. Before long, Alex is visited by the great wizard Merlin, who takes on many different forms. Sometimes, he's played by Patrick Stewart in a Led Zeppelin T-shirt. And sometimes, he transforms into a computer-generated owl. Most of the time, though, he is inhabited by the Gumby-limbed young actor Angus Imrie, who brings a witty sense of showmanship to the role. In one scene, Merlin performs some magic to prepare Alex and Bedders for a forthcoming battle and finds out that Bedders himself is an aspiring magician. ANGUS IMRIE: (As Merlin) To learn the basics of swordcraft, you will need a weapon each. A simple duplication spell for metallic objects should suffice. What are you doing, boy? DEAN CHAUMOO: (As Bedders) I do magic tricks for a hobby, but I'm no good at duplication illusions. I'm just want to video what you do and try and copy it. IMRIE: (As Merlin) I'll be most impressed if you succeed. IMRIE: (As Merlin) Now, you have an army to fight, a demon to slay, a country to save. So let us begin. CHANG: The demon in question is the evil enchantress Morgana, who is played by Rebecca Ferguson of the "Mission Impossible" movies when she isn't assuming the form of a fire-breathing dragon. Morgana was vanished centuries ago by her half-brother, King Arthur, and imprisoned deep within the bowels of the Earth. Now she threatens to break free, return to England and rule over all humanity by claiming Excalibur for herself. In order to defeat Morgana, Alex and Bedders must join forces with their old tormentors, Lance and Kaye. In "The Kid Who Would Be King," even the meanest bullies can tap into their inner kindness and decency. The story's big life lessons are like that - a little clunky, unapologetically on the nose but also hard to argue with. And for all its intended uplift, the movie never feels medicinal. Cornish has a brisk, energetic way with action. And he keeps the quest flowing from one mini adventure to the next, whether he's whisking his characters through a magic portal at Stonehenge, having them flee on horseback from Morgana's nasty minions or introducing them to the mythical Lady of the Lake, who gives the movie one of its best sight gags. Elsewhere, the script is peppered with tongue-in-cheek references to "Harry Potter" and "Game Of Thrones." And it's likely no accident that Louis Ashbourne Serkis, the actor who plays Alex, is the son of Andy Serkis, who so brilliantly captured the soul of Gollum in "The Lord Of The Rings" trilogy. It remains to be seen whether the young Serkis has his dad's chameleon-like instincts. But for now, he makes a thoroughly engaging protagonist - sweet but uncloying, brave and true, a kid you would trust to lead his entire student body into battle, dressed in shiny discount armor from a medieval souvenir shop. It's an image as ridiculous and inspiring as the movie itself. DAVIES: Justin Chang is a film critic for the Los Angeles Times. If you'd like to catch up on FRESH AIR interviews you missed, like our interview with Henry Louis Gates, host of "Finding Your Roots" about discovering his own family's history, or with Earlonne Woods and Nigel Pool (ph), co-producers of the popular podcast "Ear Hustle" about life inside San Quentin, check out our podcast. You'll find lots of FRESH AIR interviews.